Graduates of UNT's College of Education are transforming their students' lives through learning and development. Kristin Farmer ('95 M.Ed.) founded a company to assist children with autism and their families. UNT's new center will serve the community with cutting-edge autism interventions and treatments. UNT is building meaningful relationships through summer research and language programs. Energized by our four bold goals, UNT has great momentum going into this academic year. Interim dean of the Mayborn School, Roy Busby (’59, ’66 M.B.A.), celebrates 50 years at UNT. UNT's multicultural student organizations provide a platform to learn about other cultures. About a year after graduation, Christena Dowsett ('10) was facing severe depression. UNT's Texas Academy of Mathematics and Science grad Bhurin Sead was determined to get the part. Jeffrey Schmidt's ('96) work will be seen in the UNT production of Cinderella. Sam Ivie ('97), an art alum and UNT library specialist, created an award-winning portrait. The Mean Green Machine gets a green engine transplant. How can you make a political difference? Season two in UNT's Apogee Stadium brings national audience and media exposure. UNT's Institute for the Advancement of the Arts gave two faculty members a rare commodity — time. Julie Mandrell ('97) started Viaggio Lux, a luxury travel design company, in 2009. 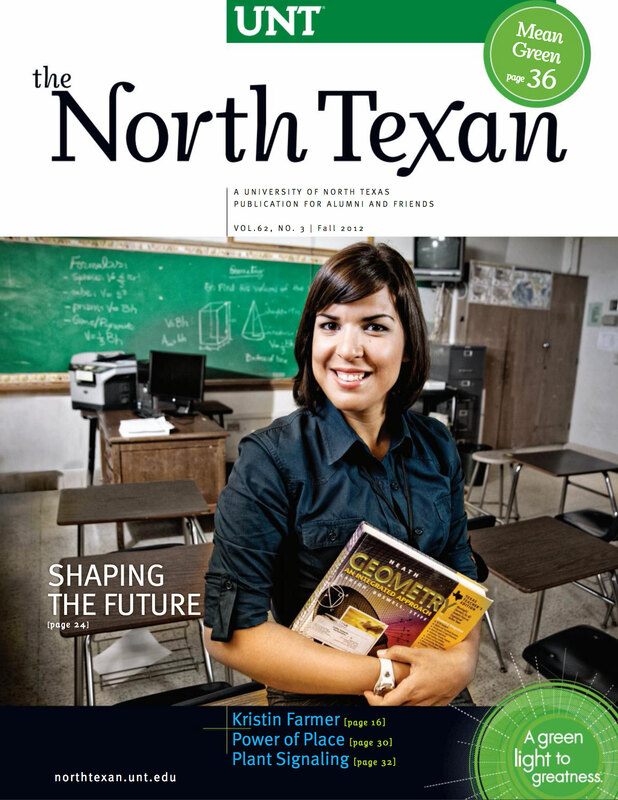 Future doctors, lawyers, educators, businessmen and some well-known names were Talons at UNT. The 2012 Mean Green football season is here, and there are plenty of social activities for alums. This fall, a new 354-feet-long pedestrian bridge will open over Interstate 35E. Bill Mercer came from a generation of broadcasters who realized that they weren't the game. Olympic track and field events make me think of my friend Max Goldsmith ('47). The fish pond ("Places on campus," summer 2012) certainly has special memories for me. Check out a behind-the-scenes slideshow featuring UNT basketball star Tony Mitchell. View a slideshow of the construction of the new pedestrian bridge to Apogee Stadium.